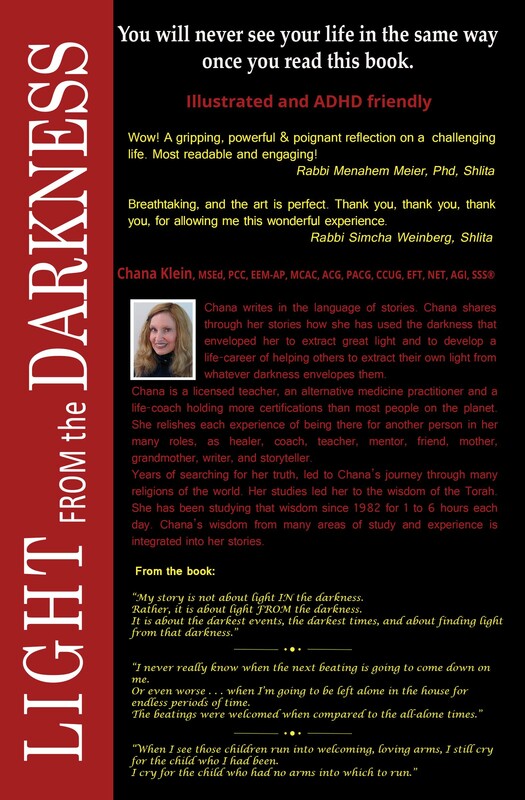 To get Chana’s journey bet her book Light FROM the Darkness: A Different Perspective on Difficult Times. 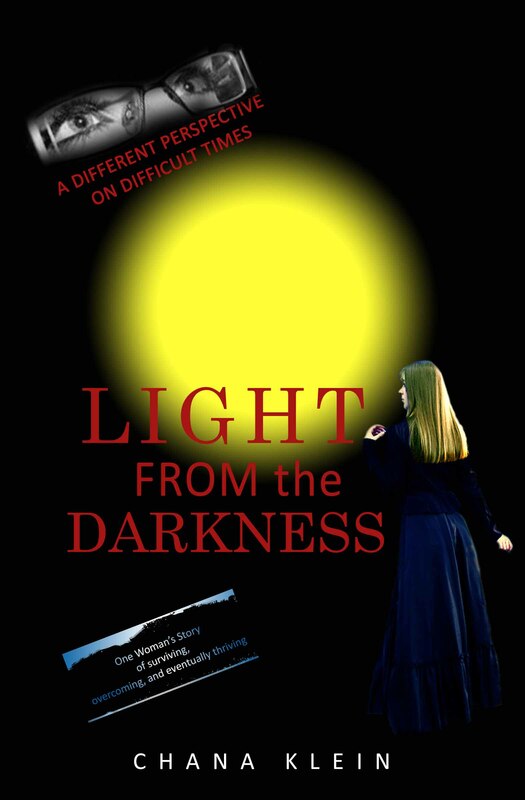 A Motivational Self-Help Book A different perspective on difficult times, and finding light from the darkness. This is the story of one woman, who, from childhood, strove to survive and to overcome the darkness, eventually thriving. Putting into words what many are afraid to say and express themselves, Chana Klein helps you go on a journey dealing with the most difficult life challenges, to come out as a more joyful person with new perspectives on life. “A Heroic, Encouraging, Inspiring, Real Life Tale of a Woman who has been Through it all, Pain, Abuse, Neglect, Horror and Shame and instead of closing up and letting fear take over, she chose Love Joy, Relationship, Honesty, and more Love, as her Way of Life. What a Way to view Darkness! As the Source of Light! Click “shop now box” link to get your copy. Please click on “Chana’s Stories” for candid stories of inspiration from Chana’s life. The Chinese word for crisis contains within it the word opportunity. I left a long career of teaching ten years ago because I became disabled by Reflex Sympathetic Dystrophy. That was, for me, a crisis. But just as all of the difficulties I have encountered became opportunities, this one too turned out to be a blessing. In search of a cure, I attended many schools of healing and eventually became certified as an Eden Energy Medicine Practitioner, as well as in many other modalities. In addition, I have completed more than fifteen coach trainings, most of them long-term (one to three years), and my practice has grown through the power of attraction. My life has been about overcoming challenges. My most recent challenge is my journey to overcome my physical disability and walk without crutches. My goal is to eventually play basketball again. I even climbed a 4-mile mountain on my crutches. I have also run a half mile in 3½ minutes using my crutches, which is faster than I ran as an athlete before I became disabled. I am able to do that, because of my crutches, not despite them. Today I have healed myself and walk normally. See below. In the same way, I have had success in my career and personal life, because of my ADD, and not despite my AD/HD. I have overcome many challenges other than AD/HD. I am also dyslexic. Because of dyslexia, at age 16½, I had still failed to learn how to read. As I talk about on another part of this site, a boyfriend rejected me when he realized that I could not read. To me, that came to mean that if I didn’t learn how to read, I might never have a boyfriend. So, I developed an avid interest in reading and began on a journey to teach myself to read. Within 6 months, I was placed in the high school’s Honor’s English class, reading a different classic each week. Today I speed-read and I am tri-lingual (Spanish, Hebrew, and English.) I became a teacher and did that for 34-years where I helped my students and their families to overcome their challenges. I have also overcome food addiction. I am in recovery 31 years and am trained as a Recovery Coach. I had been the Board Secretary for Recovery Coach International. Today I am grateful for all of the challenges because each part of that journey has led me to more and more wisdom and joy in my life. I have studied and lived many religions in my spiritual search and finally found my own truth in Orthodox Judaism. Once I discovered the Torah, realizing that I had a lot of wisdom to catch up on, for the next 21 years, I spent six to ten hours each day studying the Torah writings, never missing a day, even while working full-time. Today, I put my soul lessons on paper by writing a life lessons story each week. 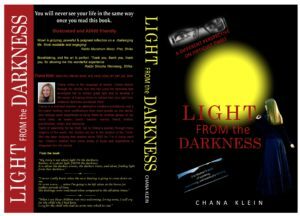 You are welcome to take a peek by clicking on “Chana’s Stories” and learn with me as the journey of each of us enfolds. Today I walk without the use of any devices like crutches. I have healed myself of all maladies and have put how I did that in my next book: Light FROM the Darkness of Illness & Physical Disability: What Makes Us Ill, What Keeps Us Ill, & How to Heal to be published soon.